Not so long ago the requirements for a hippy band were bare feet, dreadlocks, a tea chest bass and a tin whistle. If the 'Sephira Band' is anything to go by the ante has been upped - to include a unicorn on sax, Lord of the Rings characters playing stringed instruments, AND a harp constructed from a St Ayles skiff! See them in action here - they are well worth a look! 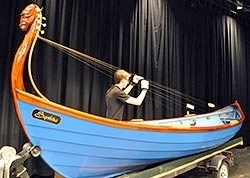 Margie Porte has been in contact with Michael Brolly who was in charge of the build, and they will both be in Ullapool for the championships. You will have to find out more for us Margie! In the meantime there is a website: http://www.themusicalark.org.